This post may be a little boring to some, but I find it interesting! The currency used in Guatemala is named after the national bird of Guatemala, the quetzal, and to the right is a picture of a quetzal in the wild. I’ve never actually seen one as they are very rare, but quetzales have the longest feathers of all animals. Here in the U.S. we’re in a recession, and I’ve been asked how that affects countries like Guatemala. Well, I’m not an economics expert, but I do know that Guatemala’s economy is very closely tied to ours. A large part of their economy is agricultural exports like coffee, bananas, sugar, and other produce. They also have large number of clothing factories that export here. But the surprising thing is that the largest source of income is actually from Guatemalans living here in the U.S. and sending money back home! So a recession here means that we buy less from them, and also that there are more Guatemalans here unable to send money back. I’ve been watching the exchange rate between dollars and Quetzales, and since I was last visiting over Thanksgiving, the rate has gone from about 7.5 up to 8.2 quetzales per dollar. 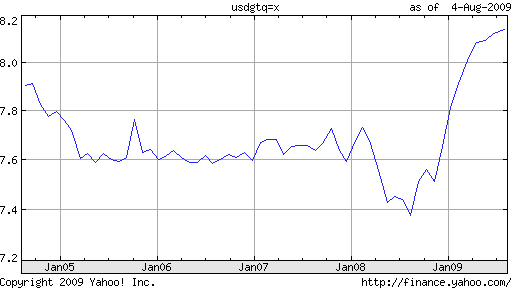 Here’s a plot below of the exchange rate over the last 5 years, and you can see how much it’s risen since last year. I feel bad saying this when this graph shows that their economy has been having troubles, but it also means that compared to last time I was there, the value of the money that I’ve been saving for a Guatemalan house has risen by about 10%! Time is flying by, and I’m only 1 week away from flying down to Guatemala for a month to make preparations for moving back down! The week before every trip is always a very busy time as I finish getting everything ready to go, and this one is much more so because of all the plans that I have for this time. I feel like I’ve been working on preparations for this trip nonstop over these last few months, and I still have so much more to do! I will be very relieved when I’ve made it through this last week and get down there. I am mailing out a prayer card to everyone that I have an address for. It’s just a little reminder that I’m doing my best to follow God’s will for my life. Please put this on your refrigerator or someplace that you’ll see frequently because I really need your prayers while I’m away and as I seek God about jobs, houses, ministry, and relationships! If you want one, just email me your address. The verse on the prayer card is Jeremiah 29:11 & 13, and it is one of my favorites because it reminds me that God loves us and is in control of all things. When life and the future seems so uncertain, I can be certain about God! He has shown me time and time again how faithful He is to us, even when we are so unfaithful to Him. And so it is such a comfort to know that He is in control! One of the comments I regularly get about visiting Guatemala is about how hot it must be because it’s located down in Central America. Well… believe it or not, but it is very cool there. Most of Guatemala’s cities are located in a very large mountain range, and we live at about 7000 ft. So the high for almost every day of the year is in the lower 70?s, and the low is typically in the 50?s. For this reason, Guatemala has been called “the land of eternal spring”. Because Guatemala doesn’t have regular seasons like we’re use to, they call the summer months from June through September winter because that’s when the rainy season is. It’s still located in the northern hemisphere like us, but because the daily rain cools the days down, that’s winter. And when I visit during the 100+ degree summers here in Austin, Guatemala certainly does feels like winter! weather feed courtesy of weather.com – thanks! Here’s another video from when I first lived at Casa Shalom in 2004. The house of teenage boys is called “los embajadores” which means the ambassadors. I was living with them and we created this music video together from all the short videos and pictures from our time together. It’s certainly not professional, but it brings back lots of great memories! 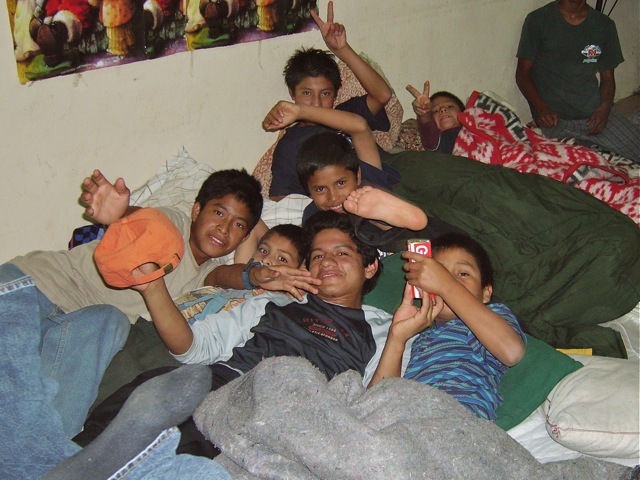 This is from back in 2004, but it’s a really well done video about Casa Shalom. Check it out here! I’ve been given the opportunity to preach and share my testimony at my church this Sunday! If you’re in the Austin area you should come this Sunday and cheer me on! If you’ve never come to North Austin Christian Church, then you DEFINITELY have to come! We start at 4:30 in the afternoon. There’s only 1 month left until I head back down to Guatemala for a month! This trip will be to make preparations for moving back permanently at the end of the year. So I fly down on August 15th and return to the United States on September 19th. If you haven’t seen it yet, I wrote about my vision and plans for the future on my main website here. Mario Castillo was the oldest guy that I took care of back in 2004 when I was living at Casa Shalom, and at the end of the year both he and another guy named Edwin graduated from high school. In 2005 I returned to school at Georgia Tech for my masters degree, and he moved from the home to live in Guatemala City to work. The following Christmas I was able to spend my semester break with the kids, and Mario came to stay with us each time he got a break from work. I distinctly remember our conversation together about how the first year was for him away from the home. He shared about the confusion about what to do in life, the difficulty in adjusting to a very different lifestyle, and the incredible loneliness he felt living away from the home. It was this conversation that really made a lasting impression on me about the great need to help these guys adjust to life outside of the home. Praise God that Mario’s still doing well! But I want to take these lessons learned with Mario and help some of the other guys who are now getting to the point of moving on. I distinctly remember how much I missed my parents and family during that Christmas visit, but on the other hand, it meant so much to Mario and the other kids to have me with them during the break. I often take for granted the incredible blessing that so many of us have of a great family to support me and help me. I want to do that for these guys! Mario is the guy in the middle of the other kids in this picture from that Christmas morning. Please keep guys like this in your prayers! 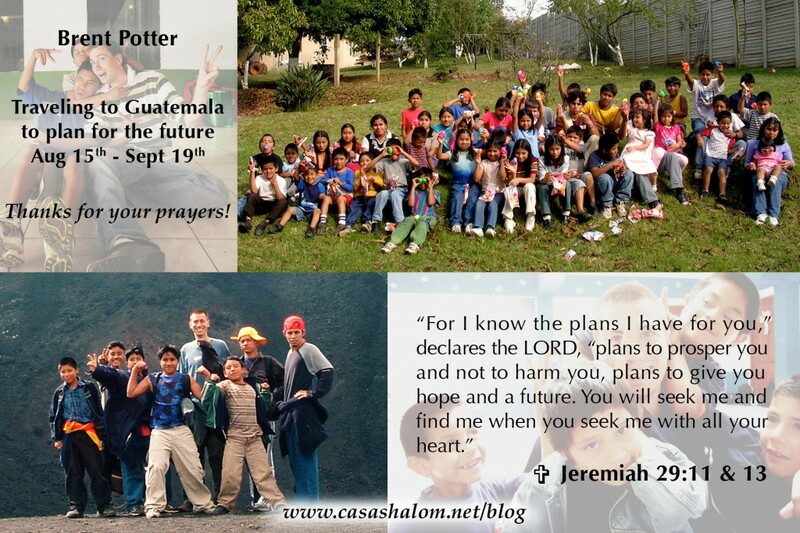 Here’s another website set up by Josh and Jessica where you can see all of the kids at Casa Shalom, and you can get information about sponsoring them. All the money given goes to the home to support the day to day needs of running the orphanage. I’m still figuring out this whole blogging thing, and I decided on a new one which should be easier for me to update. So hopefully this new blog that you’re reading will be its permanent home! This one will allow for comments and more dynamic pages, so now you can easily let me know what you think! And if you use RSS readers, there is an “Entries (RSS)” link at the bottom of the page that you can use to keep track of the updates.